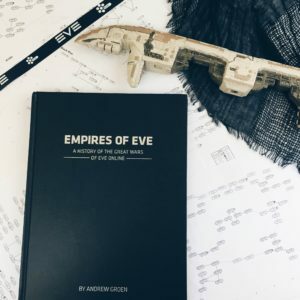 Empires of EVE is the history of how political ideas first began to take hold in EVE Online, how that led to the creation of the first governments and political icons, and how those governments eventually collapsed into a state of total war. I have to preface this review by stating up front: I’m an Eve Online player. 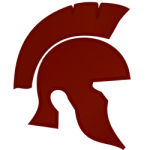 I’ve been playing since 2007, in one way or another, and while Empires of Eve covers the history of the game shortly before and around the time I started playing, I still know a lot about the game. This isn’t to brag, but rather so you understand that when I say things like ‘Groen does an amazing job explaining the complicated nullsec sovereignty system in Eve’, you can take it with a grain of salt. I think he does an excellent job of explaining many particular details of the game, but explanations like that are easier to understand for me and it is hard to tell if it would be just as clear and concise an explanation to someone with no knowledge of the game. The remarkable thing about Empires of Eve, though, is that you don’t really need to know too much about Eve Online to get into it. It is a unique book (appropriate to a unique game like Eve) in that it is a history book – about player actions in a video game. Fortunately, we’re not talking about Super Mario here, but instead a vast international landscape of people coming together in their dozens, then hundreds, then thousands, to accomplish goals inside a virtual world. What this all means though, is that all you really need to be interested in Empires of Eve is to have an interest in people, culture, relationships, and conflict. I initially read the book in electronic format, but was later sent a copy for review and posting on Instagram – and I have to say that I’m very, very fond of the hardcover edition. The cover is stark, black with silver lettering, but opens to reveal some truly tremendous artwork. There are character portraits done in watercolor, modern renditions of maps, and even shots taken straight from the game itself (which is one of the most advanced, graphically speaking, out there – despite its age). Most importantly, though, as both a reader and a player, Andrew Groen nailed every aspect of what he set out to do. He does an astounding job of introducing both the game and the player narratives to the reader without ever being boring, or bogging down too much into details. If anything, I wanted to know more about how some of these tremendous feats were accomplished by players (particularly the bits about the Russian wars), but understand that is only true for me and probably not for a wider audience. Now, I know the readers of this site (and @bookwormeverlasting on Instagram) are probably looking at this with some skepticism, but I assure you – it is a book worth reading, or at the very least gifting to anyone you know with an interest in video games. 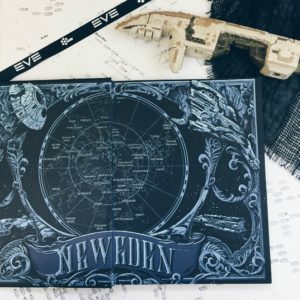 It is a wonderful window to the weird world of Eve Online, one that I hope is joined by sequels in the not-so-distant future. Great review, David! I don’t know the first thing about gaming (unless you count numerous games of FIFA against my 11 year old) but you just sold this to me!